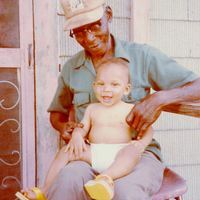 Pilgrim Black (1905-2002) with his grandson, William Bigham III (1982- ), who is also the son of Patricia Ann Black (1956- ) and her third husband William Bigham, Jr. (1952- ). This photograph was taken around 1983 or 1984 and shows Pilgrim tickling William on the porch of one of the homes built and owned by Black's mother, Maggie Benjamin Black (ca. 1870-ca. 1934), in the 1800s. The Black family migrated from South Carolina during the 19th century. Maggie and her husband, Harry Black (d. 1911), had their wood house built in the 1880s or 1890s at the corner of East 25th Street and South Sanford Avenue. Their house served as a meeting place for many of the elite members of the African-American community in Sanford. At one point, a business had asked to purchase the six acres of land that the Black family owned. Maggie agreed to sell the land under the condition that the lumber could be reused to build houses on East Tenth Street. Maggie built a large home for herself and her children and several three-room houses for rental. She later gave the houses to Pilgrim and two of her grandsons, who made several additions to convert them into homes for their families. This particular house, located at the corner of East Tenth Street and South Bay Avenue, was occupied by Pilgrim and his family. 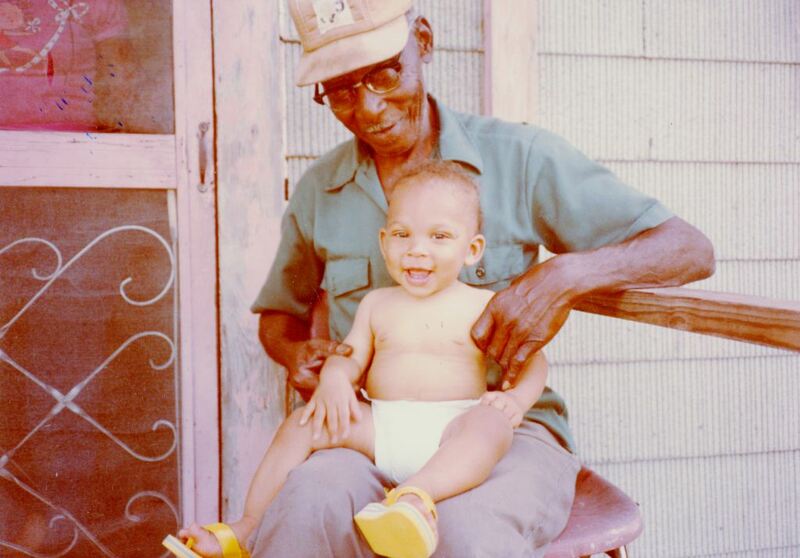 Pilgrim Black was born in 1905, although some records list 1907 as his birth year. Pilgrim and his wife, Lula Mae Haynes Black (1917-2007), were migrant crew leaders, and thus migrated to Wayne County in Upstate New York in the summers and back to their home in Sanford for the rest of the year. Pilgrim's parents, Harry and Maggiem had several other children: Leckward Black, Mustar Black, Malachi Black, Leatha Black Walker (1889-1976), Margaret Black Jones (1889-1976), and Harriett Black Lawson. In 1911, Harry owned a grocery store at 206 South Sanford Avenue. One day, he came home from work with pneumonia and passed away shortly thereafter. Pilgrim was nine years old when his father passed away. Maggie was the daughter of former slaves, Isaac and Roseanna Benjamin, and the sister of Nathan Benjamin, Pledge Benjamin, Sam Benjamin, Loui Benjamin, Chainey Benjamin, Lara Benjamin, Melvina Benjamin, and Katie Benjamin. Original color photograph: Private Collection of Patricia Ann Black. “Pilgrim Black with Grandson William Bigham III.” RICHES of Central Florida accessed April 20, 2019, https://richesmi.cah.ucf.edu/omeka/items/show/2683.